MWC 2014 might just be a couple of days away but that hasn't stopped Archos from announcing a slew of new smartphones and a tablet to boot. Headlining Archos' latest line-up of smart devices is the Archos 80 Helium 4G, slotting into its recently introduced series of 4G Helium devices. The company claims the 80 Helium 4G the world's first 8-inch 4G tablet under £229.99 (about $382/AU$426). For the price, users will get a 1024 x 768 IPS screen displaying a slightly aged Android 4.3 Jelly Bean. Tucked underneath the 8-inch screen there's a quad-core Archos A7 processor paired with an Adreno 305, 1GB of RAM and 8GBs of storage. Tablet camera connoisseurs will also be able to shoot photos with the tablet's 5MP camera and 2MP front snapper. 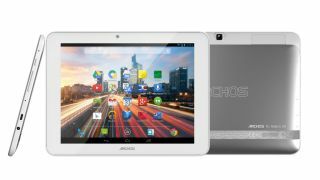 Archos has yet to announce when the 4G tablet will be shipping, but we've asked the French device maker and will update this post accordingly. Archos also announced a few new phones, including the 50c Oxygen, a handset powered by a 1.7GHz Cortex octo-core A7 chip. Along with the high-core processor, the 50c Oxygen is a dual SIM device house a 5-inch, 1280 x 720 resolution screen. Rounding out the devices' specs are a Mali 450MP4 GPU, 1GB of RAM and 8GBs of storage. The 50c Oxygen is also outfitted with an 8-megapixel back camera and 2MP sensor in front. The Archos 50c Oxygen will be sold for £219.99 (about $366/AU$407). Coming with a similar set of cameras is the Archos 64 Xenon, a 6.4-inch phablet device packing a slightly more pedestrian 1.3GHz quad-core A7. The phone has a Mali 400MP2 GPU and 1GB of RAM to help power its 1280 x 720 resolution display. The Archos 64 Xenon will arrive later this year with 4GBs for storage for £199.99 (about $333/AU$370). Lastly, Archos outted its most budget-friendly device: the 40b Titanium for only £99.99 (about $166/AU$185). The meekly priced phone is also equipped as such with only a 4-inch, 800 x 480 resolution screen. Inside, users will find a 1.3GHz A7 chip with a Mali 400 GPU, plus 512MB of RAM and 4GB of storage. The imaging options aren't stellar but there is a 5MP sensor paired with a VGA front-facing camera. All the phones will come running Android 4.2 Jelly Bean and will be available on a yet to be announced date. Until then, stay tuned for our hands-on with Archos' device line-up at MWC 2014. Archos might have some nice Android devices but the LG G Flex is really turning heads.